India’s medal rush continued in style on Monday with the country winning its tenth gold of the Jakarta Asian Games. It was javelin thrower Neeraj Chopra who swelled the entire country’s chest with pride after he threw a distance of 88.06 metres in the final to nab the gold making a javelin throw record. In other medal winners, NeenaVarakil, DharunAyyasamy and Sudha Singh won silver medals with Saina Nehwal taking home the bronze. A day on which records were shattered for the nation, India increased its medal tally from 36 to 41. The first medal of the day came in badminton with Saina Nehwal bringing home bronze for the country. After losing her semi-final against Tai Tzu Ying 17-21, 14-21, Nehwal had to settle for a third-place finish. It was Nehwal’s 10th consecutive defeat against Tai Tzu Ying, an opponent who she has never been able to get the better off. Despite the heartbreak for Nehwal, she finally brought in India’s first medal in the event since 1982. However, a win for PV Sindhu against Akane Yamaguchi meant India are assured of another medal in the women’s singles badminton category. The match tested Sidhu to the core after she was pushed all the way by the Japanese. Winning her first set, Sindhu went down in the second before recovering in bashful fashion to take home the third set and with it the match. She will face Tai Tzu Ying in a bid to create history for the country. India has never won gold at the event and neither has Sindhu ever defeated Ying in the five times she’s faced her. Meanwhile, Ying has never won a final at any of the major games. All these statistics and figures mean only one thing; a final fit for the ages, one that will go down to the wire when two of the finest players these games take to the court. 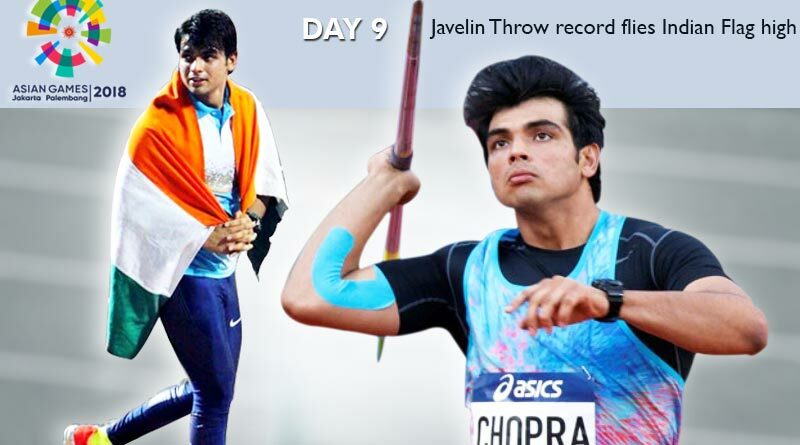 javelin throw record – The main talking point of the day for India came from javelin with Neeraj Chopra throwing a fine 88.06 metres. His effort was more than worthy of a well-deserved gold that saw the Indian flag fly at the highest point in the medal ceremony. Athletics continued to be India’s strong point with Sudha Singh putting in a fantabulous performance to win silver in the women’s 3000m steeplechase. DharunAyyasamy won the silver medal in men’s 400m hurdles after finishing with a time of 48.96s. In table tennis, the Indian men’s contingent defeated Japan in the semi-final to guarantee a historic medal for the country.